The Park is open from 9 am to 6 pm between 1 April and 30 September, and from 9 am to 5 pm between 1 October and 31 March. Admission to the Park IS FREE, but A PERMIT IS REQUIRED and must be requested at the Reception Centre (open between 9 am and 4 pm year-round, except for Christmas and New Year’s Day). A special permit is required for groups, and must be requested from the Park in advance. Park information Centre: Open to the public from 9 am to 4 pm all the year, except for Christmas and New Year's Day. Telephone: 971 892250. Can Bateman Interpretation Centre: Open to the public from 9:00 am to 4:00 pm all the year, except for Christmas and New Year's Day. The itinerary begins in front of the Can Bateman Interpretation Centre, which you may visit either before or after your outing. This will give you some insight to the history of S’Albufera and will offer you an introduction to its main physical and biological features. As soon as you leave the Can Bateman Interpretation Centre, you will come to a wooden bridge that crosses the Canal des Sol. This is one of the Park’s main canals, and like many others, it was built during the second half of the 19th century, in an effort to drain the wetland. A genuine army of 1500 men from all around Majorca and abroad would work under the orders of British engineers to drastically transform this land, until 1871. By then they had managed to dry out 2,146 ha. of the wetlands. After undergoing new floods and salinisation processes, most of the area was abandoned and returned to its natural state. The water that runs through the Canal des Sol comes from two different sources: the surface runoff, and rises in water table levels. From time to time you may see an eel (Anguilla anguilla) swimming through the canal. This is one of the most prized and typical fish species in S’Albufera. The eel is caught here and in other canals via the traditional pesca amb cucada, or “worm fishing” system (a fishing rod and line baited exclusively with worms, with no hook). It is the voracity of the eels that makes it possible to pull them out of the water and skilfully place them in a shrimp trap located in the irrigation ditch, where they are kept alive. The eel is ultimately used in the preparation of some of the region’s typical dishes: espinagades, or eel pastries, fried or stewed eel, eel with noodles and the eel casserole... which are never missing for the Sant Antoni Festivals in Sa Pobla and Muro. In addition to eel, you will also see other fish such as different mullets and the carp (Cyprimius carpio), a species that was accidentally introduced to the Park, leading to significant ecological imbalances in the aquatic environment. Moved by the runoff, different submerged plants such as the hornwort (Ceratophyllum demersum) and the sago pondweed (Potamogeton pectinatus) are both a food and a refuge for a vast number of small animals and a few aquatic birds, such as the coot (Fulica atra), which is black in colour with a white beak. If you continue along the trail you will come to the Pont de Sa Roca (a bridge), which crosses the Gran Canal. This area still bears the signs of the severe transformation that S’Albufera was subjected to at the end of the 19th century: bridges, canals, siphons, and similar structures. In a word, these infrastructures were set up to re-channel the water in an effort to drain this wetland area. The sluice gates here are currently used to improve water management in the wetland. The water runs through the Gran Canal, which is 50 meters wide and 2,700 meters long, until it finally spills into the sea through “S’Oberta”, located at the Pont dels Anglesos. This bridge dates from the same era as that of the bridge you are on now. Both of these bridges have five arches and were built with limestone blocks over a foundation of pinewood piles. They are 110 meters long, and have an original width of 5 meters. The spans of the bridges’ five segmental arches gradually become smaller towards the ends. Thus, the central arch measures 9.30 meters; those on either side of it have 8-meter spans; and the spans of the two end arches measure 7.10 meters each. The Gran Canal needs to be cleaned periodically, due to the gradual build-up of sediments carried by the flood streams. The construction of the canal was finished in 1871. Here once again, you will want to take in the flora and fauna around you. The field elms (Ulmus minor), with their root systems, sustain the substratum of the riverbeds that run parallel to the Gran Canal and which form S’Albufera’s main paths. This foliage comprises what is known as the bosc de ribera, or riverine woodland, which offers very pleasant shade in the summertime. The most easily spotted aquatic birds in this area are the coot (Fulica atra) and the mallard (Anas platyrhynchos), the most abundant and well known duck species here: the drake stands out for his green head. On sunny days, the European pond turtle (Emys orbicularis) sunbathes along the banks of the canal, and if you look up, you may see the striking Eleonora’s falcon (Falco eleonarae), which often shows off its keen hunting skills to catch dragonflies and other insects during the spring and summer months. Heading to the north, you will take the Camí des Senyals path. This path takes its name from a sluice gate that was once opposite it, which channelled the water towards either Can Blau or Sa Manegueta. The gate was painted in two colours, white and red, displaying one colour or the other, depending on its position. Just about hundred meters from the bridge you will see a small observation platform, known as the Plataforma des Cibollar. It was built by the Balearic Association of Friends of the Parks (ABAP) with funding from the Bishop family, and is located above the Riego Canal. The Riego Canal was designed to channel and distribute the fresh water of the Son Sant Joan spring throughout S’Albufera’s scattered rice and hemp fields. While it was once 72 km long, today only the sections parallel to the Ses Puntes and Senyals paths continue to be in fairly good condition. The water was pumped from the spring using a large hydraulic wheel that was propelled by a steam engine. From the platform you will in the vegetation on each side of the Senyals road. The west side, where there is more fresh water, is abundantly populated by the giant reed (Arundo donax), the common reed (Phragmites australis) and the great fen-sedge (Cladium mariscus). On the other hand, the more brackish areas on the side closer to the sea accommodate rush (Juncus spp), tamarisks (Tamarix spp ) and glassworts, as these plants have adapted to the high salt concentrations of their environment. All parts of the giant and common reeds are put to good use: the leaves, the stumps, and particularly the stems, which are tall, stiff, smooth and hollow, are widely used thanks to their lightness and durability. Other species to look out for are the sedge (Carex spp), the great reed warbler ( Acrocephalus arundinaceus ) and the viperine snake (Natrix maura), which is very commonly found along this trail. The jonquil is a plant with thin, narrow, flexible leaves. Its tubercular roots serve as a food for countless ducks. Continue down the same trail, and once you have gone about 1 km, there will be a curve that will take you around to the left, leading to Es Colombars, which is just past a small bridge that crosses over the Ferragut Canal. Es Colombars is one of the two areas with the greatest number of llissers, or small lagoons, made up of a grid of perpendicular canals that cross it from one end to the other. One of the most inaccessible areas of S’Albufera with such large llissers, this is the primary winter refuge for aquatic birds. This area, and particularly Es Cibollar, is full of salty pools where plant communities distribute themselves in a complex mosaic, depending on the small variations in relief and soil composition. Prevalent here are the rush and the common reed, as well as one very important species, the Scirpus maritimus, which bears fruit in the summer, its seeds being a good source of food for the winter ducks. The brackish pools accommodate many invertebrates, which are prey for numerous birds, such as wading birds (plover Charadrius spp, peeps Calidris spp, stilts Himantopus himantopus, lapwings Vanellus vanellus, etc. ), water rails and ducks. At this point you are on the trail that goes in through Es Colombars, on a wooden walkway that allows you to walk through the wetlands. Continue until you come to Es Colombars Hide. This is the last point on your itinerary. From this hide you will see countless animal and plant species, as well as the breakwater commonly known as the malecó de Gesa (after the name of the electric company), which was built in 1979 when the refrigeration pipes were installed for the Murterar power station. Particularly worthy of note among the plants that you will see here are the (Arthrocnemum macrostachyum), the tamarisk (Tamarix spp) and the golden samphire (Inula crithmoides). Among the birds, we must point out the osprey (Pandion haliaetus), the pochard (Aythya ferina) and the cormorants (Phalacrocorax carbo). The osprey is a large bird that feeds on the different mullets species in the larger canals and ponds. The few osprey pairs that live on the mountainous northern coast of the island come to fish in the waters of S’Albufera. This trail runs through the central part of the Park, one of its richest and most diverse areas. Moreover, it connects with other trails, particularly that of Es Cibollar, offering the visitor a more extensive idea of the different ecosystems found in the wetland area. The itinerary begins in front of the Can Bateman Interpretation Centre, which you may visit either before or after your outing. This will give you some insight to the history of S’Albufera and will offer you an introduction to its main physical and biological features. Like the Park’s other administrative buildings, the Can Bateman building is located in the area known as Sa Roca. This has been the very heart of S’Albufera since the British installed their powerful steam machine to drain these wetlands. Given that this fort is located closest to the centre of the entire wetland area, it was here where the company that set out to drain the wetland in the 19th century installed much of the machinery and buildings needed to carry out this task. Later on, during the 20th century, the site became the home of a major paper company, which used the common reed and fen-sedge as raw materials. The paper factory was operative until 1996. Finally, with the Balearic Government’s purchase of the land and its declaration as a Nature Reserve, Sa Roca became the centre for the administrative buildings, visitor’s centre and the staff utility buildings. From Can Bateman you will take a narrow path that leads off to the left, heading south. Once you have gone some 150 metres down this little footpath, you will come to the Ras Hide, which was funded by the Regional Parliament of Majorca. Here you will make some very interesting observations. This hide looks out over a vast terrace known as Es Ras, where animal management has made it possible to clear considerable areas of open waters that currently accommodate countless flora and fauna species. While it may be hard to believe, before livestock was released here,this area was a tall and impenetrable reed bed. Es Ras is a grazing land for many different types of livestock, and particularly for the Majorcan cow, a breed that at one point was on the brink of extinction. In fact, even today a large part of its total population lives in S’Albufera Park. In the winter Es Ras is completely flooded, yet it usually dries up in the early summer, only to fill up again with the water from the September storms. Along the roads surrounding Es Ras, in areas that are not accessed by the cattle, you will see some interesting plant species, including white poplars (Populus alba) and elmleaf blackberries (Rumus ulmifolius). Both plants will accompany you along your excursion. You will also see a few wild rabbits (Oryctolagus cuniculus), which are easy to spot in the driest areas on spring and summer afternoons, as well as the creeping cinquefoil (Potentilla reptans), a small creeping plant with serrated leaves separated into 5 leaflets and very bright, almost waxy looking yellow flowers. This plant blooms in the spring and summer. In the flooded areas you will see numerous animal species. Particularly worthy of note among them are the aquatic birds. The grey heron (Ardea cinerea), a very large grey-coloured bird with its very long neck and legs and its straight, powerful beak, feeds on fish, crabs and frogs. It can be spotted easily year round. Also found throughout the year is the red-crested pochard (Netta rufina). The female of this species is earth coloured and has a lighter face. This duck was reintroduced to the Park during the 1990s, after being driven to extinction here in the early 19th century. The shoveler (Anas clypeata), on the other hand, is an almost exclusively winter inhabitant. With its thick, wide beak, it is found in abundance in open and shallow water areas. The male has a dark head with red sides. Yet it is not only birds that you will find here. This area is also the home of many invertebrates, such as the red swamp crayfish (Procambarus clarkii), which was unintentionally introduced in the 1990s. It is also common to see a bat or two at sundown, such as the pipistrelle bat (Pipistrellus pipistrellus), the most common of all here. Travelling in large numbers, it fills the evening and night skies over tree-populated areas, where it can hunt insects. During the day, it sleeps in caves and the nooks of nearby buildings. If you continue along this trail you will come to a hill known as the Turó de Sa Roca, which you will go up after crossing a small wooden bridge. While on the bridge, you may wish to look down at the large number of fish and submerged plants that populate the small canal below. A whole trophic network made up of seaweed, plants, insects and other invertebrates, fish, turtles, snakes, frogs and diving birds can be found in the waters of the canals and lagoons. Once a top the small Sa Roca Hill, you will get a better idea of the actual expanse of the Park as well as its main ecosystems. In addition to Es Ras, you will also see the large, almost endless masses of reeds that grow inland, towards the towns of Muro and Sa Pobla. These reedbeds are one of the Park’s great treasures, as the refuge of protected species that are very hard to see in other places. Such is the case of the moustached warbler (Acrocephalus melanopogon), a small insectivorous bird with greyish, earth-coloured feathers and a white stripe above the eye. Often sighted flying above the reedbeds are barn swallows (Hirundo rustica) and marsh harriers (Circus aeruginosus). The barn swallows flock together in extraordinary groups (dozens of thousands of birds) in the Park every autumn and spring, along their migration path between Europe and Africa. Though at first sight the reedbed only appears to have reeds, many other plants are also found there. Certainly worthy of note is the great fen-sedge (Cladium mariscus) and the hedge bindweed (Calystegia sepium). The great fen-sedge is a thick plant with very long, narrow leaves with serrated edges that make the plant dangerous to touch. The hedge bindweed is a vivacious creeping plant with triangular leaves and large white flowers that grows over the common and giant reeds. It flowers in the summer and dries out in the winter. Sa Roca Hill was raised by the Park’s management, using the material extracted from the Sa Roca adaptation lagoon, which you will see at the foot of the hill, looking out towards the Park’s administrative buildings. It is here in this small lagoon where wounded animals or those in need of an adaptation period are placed, before finally being set free. Here you will see birds, frogs, turtles and fish. As you continue along this trail you will come to a crossroads, just past a first canal, the Canal des Sol, over Sa Roca Bridge. If you look carefully, you will see a small narrow path off to the left that will take you to the Gran Canal Hide. From this observatory you will enjoy a close-up view of the evolution of countless fish, such as the flathead mullet (Mugil cephalus), which abounds in S’Albufera and can reach a length of up to half a meter, with a large head that makes it easy to spot. Accompanying the flathead mullets are other mullet species and carp, an occasional pond turtle, and countless bird species, with particularly large populations of coots (Fulica atra), common moorhens (Gallinula chloropus), purple gallinule (Porphyrio porphyrio) and different duck species. You will also often spot little grebes (Tachybaptus ruficollis), and if you are here in the winter, you might see the great cormorant (Phalacrocorax carbo). It is here at this hide that the route ends. We suggest going back several meters until you reach Sa Roca Bridge, where some of the Park’s other trails connect. 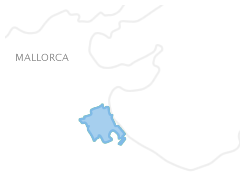 We particularly recommend taking the Es Cibollar trail, also on foot. This itinerary is the perfect complement for what you have just seen, as it will take you into elm forests and salt marsh areas, with ecosystems that are completely different from those you have seen thus far. Along with the Sa Roca trail, this route runs through the heart of the Park, one of its richest, most diverse areas. We recommend taking it easy as you go along, making long stops at the different points of interest (hides, bridges, canals). Take the path that leads off to the right, heading north. You will immediately see a small wooden bridge that crosses the Canal des Sol, to bring you closer to the banks of the Gran Canal. The Park’s main canal, the Gran Canal crosses it from east to west, until it reaches the sea. This canal takes in the waters of the streams of Muro and Sant Miquel, two of the island’s most important streams. The large, Gran Canal is not natural, but rather the product of a man-made construction that ended in 1871. Previously the waters of S’Albufera spilled into the sea through the lagoon, Estany dels Ponts, and only occasionally passed through this area. The Gran Canal needs to be cleaned periodically, due to the gradual build-up of sediments carried by the flood streams. At the bank of the Gran Canal, in spots where the common reed (Phragmites australis) thins out enough to come up close to the water, you will enjoy seeing a number of different fish, such as the flathead mullet (Mugil cephalus). This species abounds in S’Albufera and can reach a length of up to 50 cm, with a large head that makes it easy to identify. You will also see other mullets and carp, an occasional European pond turtle (Emys orbicularis) and countless bird species, with large populations of coots (Fulica atra), common moorhens (Gallinula chloropus), purple gallinule (Porphyrio porphyrio) and different duck species. The little grebe (Tachybaptus ruficollis) is also found here, and in the winter you should spot a few great cormorants (Phalacrocorax carbo). If you continue along the banks of the Gran Canal until you come to a crossroads, on the right you will see the bridge known as Pont de Sa Roca, or Sa Roca Bridge, which crosses the Gran Canal. This bridge is 110 meters long and has an original width of 5 meters. The spans of the bridge’s five segmental arches gradually become smaller as they reach the ends. Thus, the central arch has a span of 9.30 meters; those on either side of it have 8- meter spans; and finally, the spans of the two end arches measure 7.10 meters each. Here at this bridge, you will want to again take in the flora and fauna around you. The field elms (Ulmus minor), with their root systems, sustain the substratum of the riverbeds that run parallel to the Gran Canal and which form S’Albufera’s main paths. This foliage comprises what is known as the bosc de ribera, or riverine woodland. The most easily spotted aquatic birds are coots (Fulica atra), which can be identified immediately by their black colour and white beak; and the mallard duck (Anas platyrhynchos), the Park’s most well known and commonly found duck species. Once you have crossed the Gran Canal you will come to yet another crossroads. This time you will take the narrowest road, on the righthand side, which will lead you through a cluster of trees that form a dense riverine woodland. As you have already seen, the riverine woodland is primarily made up of elms (Ulmus minor), which offer visitors greatly appreciated shade in the spring and summer. Unfortunately, grafiosis, a fungal disease, has spread to much of the elm population, which is gradually being replaced by other more resistant species such as the wild olive (Olea europea var. silvestris). In addition to trees and shrubs, mention must also be made of the smaller plants that grow beneath the shade of the woodland, such as three- cornered garlic (Allium triquetum) and lords and ladies (Arum italicum). Growing out of the trunks of some trees are black poplar mushrooms (Agrocybe aegerita), a cream-oloured wild mushroom that is cherished in the region for its gastronomic value. It sprouts up in large quantities after autumn and spring showers. Amid the branches of the woodland you may see a flock of small birds that will most often charm you with their song. Abounding here in the spring and summer are the nightingale (Luscinia megarhynchos), and the Cetti’s Warbler (Cettia cetti) lives here year-round. The speckled wood butterfly (Pararge aegeria) is also commonly found throughout the year in the riverine forest. It is muddy in colour with three large eyes on its hind wings. The cabbage white butterfly (Pieris spp) is medium sized and generally white in colour, with a few black flecks on its wings. It is very nervous and can only occasionally be seen still. To finish, you will also want to bear in mind the mammals, which tend to be a bit more hidden and are hard to spot, given their twilight and nocturnal customs. All the same, they also abound in this area of the Park. In addition to mice and rats, there are rabbits and bats, and with some luck you might spot a pine marten (Martes martes). If you are patient you will more easily see the least weasel (Mustela nivalis), a small earthy coloured mammal with a white belly. If you continue along the trail through the riverine forest, you will come to the two Bishop Hides, which are separated from one another by some one hundred meters. These two hides were among the first to be built in the Park and look out over the vast expanses of salt marsh of Es Cibollar. Among the plants found in this area, you will see a glasswort forest, which always grows in places with very high salinity. This is a great spot to behold the relationship between S’Albufera and the sea, as the seawater forms part of the aquifer and determines the salinity of the soil, which is rich in silts and clays. In the winter, the rainwater accumulates here and the land is flooded, becoming very wet. Evaporation is intense in the summer, meaning that the salt settles just at the surface of the soil, where it is sometimes visible as a white deposit. This annual cycle determines the adaptations of the different plants. Annual plants have a very fast cycle, meaning that they germinate, blossom and bear fruit after the winter flood and before the summer salinity sets in. Perennial plants, on the other hand, are thick and equipped with powerful osmotic mechanisms to obtain water. These plants include the samphire (Sarcocornia spp), the glasswort (Arthrocnemum spp), the glaucous glasswort and some rush species. The pools of the springtime and autumn are gathering points for many wading birds, and a breeding ground for both plovers and stilts. The glasswort forests accommodate large groups of egrets. The noisy cry of the water rail can often be heard there, and the duck population is numerous and diverse in the winter. The stilt is a very long-legged wading bird that inhabits brackish areas and feeds on worms and insect larvae. It builds its nest on small mounds of plants, and its chicks begin to walk just minutes after birth. The smallest duck that you will see here is the common teal (Anas crecca), which breeds in Northern Europe and comes together in large flocks to spend the winter in the open areas of S’Albufera. The male has a green and pink face, whilst the female is muddy in colour. The water rail, which is from the same family as the European gallinule, is very shy and elusive, yet there is no confusing its voice, as it sounds like a piglet grunting and squealing within the thick vegetation. In the pools of Es Cibollar it is not at all uncommon to see a small American fish that was introduced to the island in the 19th century to help fight malaria, as it feeds on mosquito larvae: the mosquitofish (Gambusia affinis holbrooki). Once you reach the backside of the two hides, you will need to turn around and take the same road back. We recommend walking back in peace and quiet. There are so many different species that live in the riverine forest, that if you take a bit of time you’ll be sure to see new forms of life that you did not see on the way out. This is the longest itinerary offered in the Park and will enable you to enjoy the different natural environments found here, while offering you direct contact with part of S’Albufera’s ethnological heritage. This route goes around nearly the entire Park. The itinerary begins in front of the Can Bateman Interpretation Centre, which you may visit either before or after your outing. This will give you some insight to the history of S’Albufera and will offer you an introduction to its main physical and biological features. Take the path that leads off to the right, heading north. Once you have crossed a small wooden bridge you will come to Sa Roca Bridge, which crosses the Gran Canal. From this bridge, you will want to look closely at the flora and fauna around you. The field elms (Ulmus minor), with their root systems, sustain the substratum of the riverbeds that run parallel to the Gran Canal and which form S’Albufera’s main paths. This foliage comprises riverine woodland, which provides very pleasant shade in the summertime. Here the most easily spotted aquatic birds are Camí d’Enmig and Punta des Vent Iron bridges and Camí des Polls the coot (Fulica atra) and the mallard duck (Anas platyrhynchos). In the spring and summer you are also bound to see the European pond turtle (Emys orbicularis) sunbathing, as well as Eleonora’s falcon (Falco eleonorae). As you head towards the Punta des Vent Observation Tower, you will be going along the road known as the Camí d’Enmig, which used to connect the town of Sa Pobla with the sea. Lining the sides of the road is the fine foliage of the common reed (Phragmites australis), which can reach a height of up to 5 meters. Found in the freshwater areas, it looks dry in the winter and regains its green colour in the spring. Be sure to go to the top of the observation tower, which you will see in the road. From above, you will have a panoramic view of the Park and the towns of Muro and Sa Pobla. At this point you will see the two streams (Muro and Sant Miquel) that come down from the Tramuntana Mountains and supply the wetlands with water. From this lookout you will more easily distinguish among the giant reed, Arundo donax (a thick, woody gramineous plant of Asian origin with a height of 6-7 meters), the common reed (a thinner yet more abundant autochthonous plant) and the Cladium fen-sedge (which forms beds full of sharp serrated leaves similar to those of Mauritanian grass). In the summer, on the banks of the canals, you may catch sight of the purple heron (Ardea purpurea) on its hunt. This large greyish and reddish coloured bird feeds on fish, crab and frogs. You will also see the thicklip grey mullets (Chelon labrosus), which are very common in the canals and usually travel in vast schools. After your stop at the tower, you will continue along the Camí d’Enmig until you reach a fence and the area of the iron bridges. These are remnants of S’Albufera’s 19th-century industrial architecture. Passing beneath Can Blau Bridge is the stream known as the Torrent de Sant Miquel (here you need to be very careful, as this is a highly travelled thoroughfare). Follow the signs and go further down the road. Once you have passed the GESA meteorological mast and the irrigation canals of Son Senyor and Son Amer, this road will take you to Son Carbonell Bridge, which crosses the stream, Torrent de Muro. The Son Carbonell and Can Blau bridges were the first iron bridges ever to appear on the island, and were built in England as part of the 1866 project to drain S’Albufera. Each one rests on a foundation made up of 200 pinewood piles. Still visible in this area is a traditional cultivation system known as veles (Sa Marjal). This is a cultivation system built over previous floodlands by digging irrigation ditches and amassing the extracted soils in small plots. Here you will enjoy the swamp orchis (Orchis robusta), which blooms in flooded areas in the spring. Amid the foliage you will see the elusive squacco heron (Ardeola ralloides), a small, cream-coloured heron. In the winter one of the birds most commonly found in the area is the European starling (Sturnus vulgaris): at dusk these flocks offer a spectacular show as they come to the reed bed to settle down for the night. You will now continue along the Camí des Polls. This road takes its name from the trees that line it: the very tall white poplars (Populus alba), which are typical of the banks of the canals and streams, as they require high levels of humidity to survive. On the other side you will see the irrigation canal known as the Sèquia des Polls. This canal is highly dependent on the spring, font de Sant Joan (in Muro), which supplies it with fresh water. You will most probably find animals grazing in the road (they are not dangerous at all, as long as you do not bother them): these autochthonous Majorcan cows and oxen are ecologically and sustainably controlling the growth of the vegetation, while at the same time reducing the danger of forest fires. You will come to Sa Font Bridge. Below it flows the cleanest water in the Park, which comes from the spring known as font de Sant Joan. Here you will need to pay close attention to the signs, as you will be taking one of the rural roads that go around the Park. In this area you will see the current agricultural uses of the outlying areas and the underground water extraction systems to irrigate the crops through norias. The road will take you to the area of S’Amarador Lagoon, the name of which makes reference to the old pool formerly located here, where all the hemp grown in S’Albufera and its surrounding area was soaked. In 1991 a good part of this essentially forsaken land was dredged to recover a new area of open water: the lagoon known as the Llacuna de S’Amarador. Growing abundantly in this area is the cattail (Typha dominguensis), a plant traditionally used to cord chairs. Once you have taken in the lagoon, Llacuna d’Amarador, your discovery will continue along the road, Camí d’en Pep. This might easily become a parade of birds. The purple gallinule (Porphyrio porphyrio) is often sighted crossing the road. This is a large and robust looking bird with blue plumage and a red beak that lives in the thick of the reed bed. Having disappeared from the area during the last century, it was reintroduced to the Park in the 1990s. The common moorhen (Gallinula chloropus) is also easily spotted along the road. Also apt to catch your attention is a dark-coloured medium-size bird of prey that will likely be flying over the reed bed: the marsh harrier (Circus aeruginosus). At the end of the road you will come to the area known as Ses Puntes, a fossil dune formation that comprises different natural environments: pine groves, freshwater and salt marshes, cropland, and the remains of agricultural structures and architecture. The first of these structures to appear are the remains of the houses known as Cases de Ses Puntes. This area deserves special attention: one can see the well-conserved Canal Riego, and the observation platforms of Ses Puntes and Es Ras overlook the fauna that lives amid the vegetation. The pine grove of Ses Puntes conserves lush pine trees (Pinus halepensis) that grow atop the fossil dunes, forming small islets of vast natural beauty and ecological wealth. The hill known as the Turó de ses Eres, which gets its name from an old threshing floor that can no longer be seen, was once the milling site for the rice cultivated in S’Albufera. There are also a number of fig trees (Ficus carica), which resulted from the seeds scattered by the birds as they eat. Some are remainders of trees that were planted at the time rice was cultivated here. In the summer this is a good place to watch the bee-eater (Merops apiaster), a colourful insectivorous bird that inhabits places with sandy areas, where it hunts dragonflies and bees. This bird makes its nest in very deep holes in the sand. In the winter it migrates to Africa, only to return again in the spring. The little egret (Egretta garzetta) is an all-white, medium-size bird that began to breed amid the pines here just a few years ago. At this point you are coming to the last section of the trail, where it links up with the Park’s main access road. At just this crossroads you will see the Santa Margalida Bridge. Here you may decide to return to the reception centre and visit the interpretation centre if you did not do so before, or you can head to the Park exit and conclude your excursion.